WHAT IF PICASSO HAD DESIGNED A JAGGED CUBIST FORTRESS? 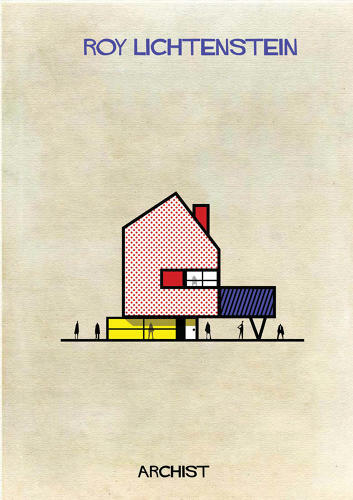 FEDERICO BABINA EXPLORES THIS AND MORE ARTIST-ARCHITECTURE MASHUPS IN A NEW ILLUSTRATION SERIES. In his latest illustration series, "Archist," Barcelona-based designer Federico Babina imagines what buildings might look like had they been designed by 27 famous artists in their signature styles. What if Picasso had designed a jagged cubist fortress? What if Damien Hirst slapped his trademark polka dots onto a sleek modernist pad? What if Piet Mondrian lent his elegant approach to geometry and color to an apartment building? Throughout history, movements in art and architecture have been inextricably linked, subtly influencing one another. Babina makes this exchange of influence as literal as possible, applying artists' signature aesthetics to imaginary living spaces. “A sculpture is like a micro-architecture, a facade can become like a painted canvas and a building can be shaped as in the hands of a skilled sculptor,” Babina writes. Some of the artists in Babina's series actually did dabble in architecture: Salvador Dali, for example, whose surrealist style Babina translates into a teardrop-shaped alien pod, designed parts of the Port Ligat house where he lived in Cadaques, Spain, as well as his carnivalesque Theater-Museum in Figueres. Christo, whose imaginary building is draped in saffron curtains, channeling his installation “The Gates,” works in transforming large-scale structures with dramatically draped fabrics. Babina's buildings come together in "Archist City," which resembles a fantasy theme park for art school nerds. Can someone please go build this? The "Archist" illustrations are available for purchase as posters from Babina's website.